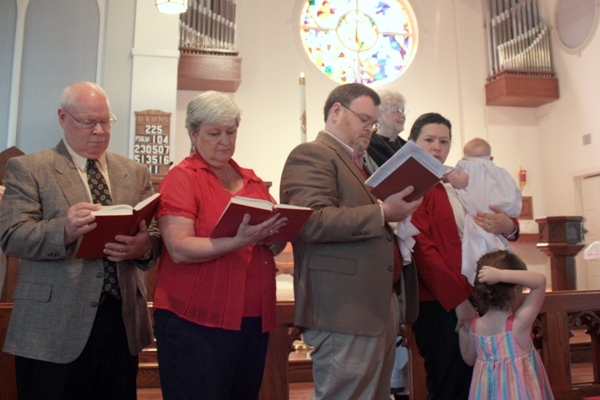 Elyse was baptized this morning at our church, St. Matthew's Episcopal, almost exactly three years after her big sister was baptized. 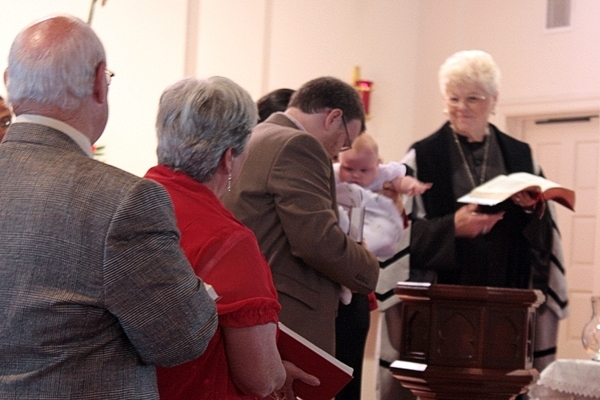 Elyse did a fine job of maintaining her baby dignity and composure, and it seemed clear to us that she will take her baptismal covenant seriously--most importantly, I believe, the vow to "strive for justice and peace among all people, and respect the dignity of every human being," perhaps the finest ideals to which any human being can aspire. Jessica also did very well. I've never been prouder of my two daughters. Here are four pictures from the event. 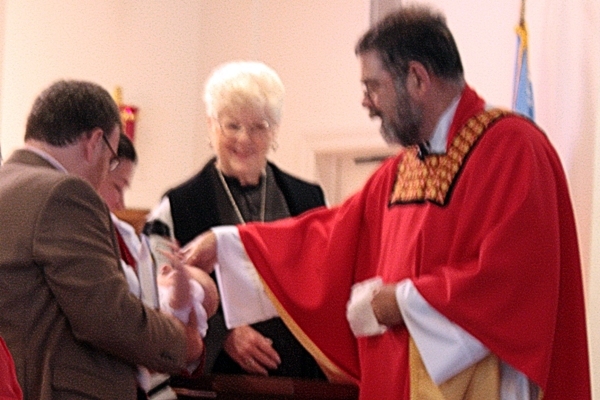 Also pictures above are Father Doug Coil and Anita Genung of St. Matthew's, and, of course, Granny and Pa. "...If you're going to care about the fall of the sparrow you can't pick and choose who's going to be the sparrow. It's everybody, and you're stuck with it." You can't pick and choose, it's everybody. As Father Doug points out, we are commanded to love and care not just for those people we like, or who have the same beliefs as us, or who look more or less like us, or who live in the same city or state or country as us. We vow to strive for justice and peace among all people, and respect the dignity of every human being. A daunting promise, yes, but one worth contemplating and trying to keep. I think also of a line from one of Garrison Keillor's Lake Wobegon stories, "Gospel Birds," when the members of the Lutheran church congregation are sitting in quiet contemplation for a few moments, and they remember "times when they had performed acts of kindness and love and mercy despite the embarrassment of it." I have long thought that this is one of Keillor's keenest insights, that performing acts of kindness and love and mercy can be embarrassing, especially in the culture we live in today. But that we do perform those acts can also be, as Keillor says, a sign of "a presence of grace in the world that lifts all of us up." I think also of the unnamed man in John Denver's song "Rocky Mountain High," who is "seeking grace in every steps he takes." 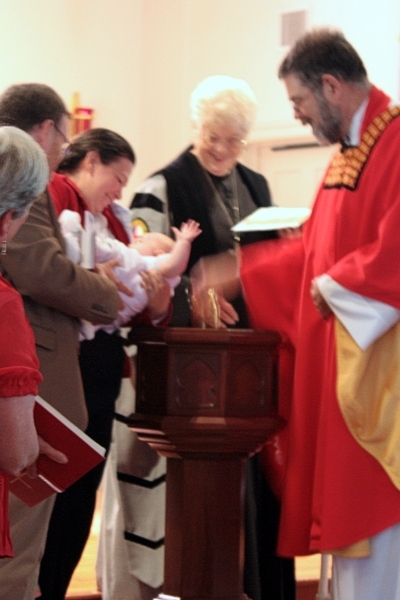 Madeleine L'Engle, Garrison Keillor, John Denver...perhaps not the people most people think of when they contemplate baptism, but they all have something to say to me.